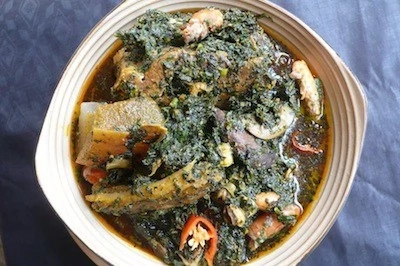 Otong soup with oxtail meat is a delicious soup in calabar that is prepared with rich okra and oxtail meat. Oxtail meat is a meat gotten from the tail of an ox. Below are the ingredients and recipe for cooking otong soup with oxtail meat. Crayfish is another important ingredient in preparing otongsoup, it is as well a source of protein and gives the otong soup that crayfish taste. Crayfish is brownish in color with tender thungs at its tall. Crayfish comes in different sizes depending on the specie. We have the large size crayfish which they call prawn or oporo in some parts of the Eastern region of Nigeria. Periwinkles are important ingredients in the cooking of otong soup with oxtail. It is a source of protein and is added to the meat or fish used in cooking otong soup. The presence of periwinkles go a long way in making the otong soup more palatable and appetizing to the eye and to the mouth. It is used not only to prepare otong soup with oxtail, but also to prepare most local and international dishes and soups. For instance, in Imo state, periwinkle is used to prepare one of their indigenous soups called ofeowerri, which I included in my series of articles. They believe that even if you cannot afford meat or fish in the market at least with the presence of periwinkle , you can still enjoy your soup because periwinkles are palatable and yet cheap source of meat. Pepper is yet another useful ingredient in preparing otong soup with oxtail, it gives it that peppery taste, and makes the soup sharper in taste. Dry ground pepper is most suitable for the cooking of oxtail meat pepper soup, though other species can still be used depending on the way you ground it. Just like you find in other dishes, onions is vital in cooking otong soup with oxtail, it makes the soup or it gives the soup that sassy taste. Onions can be put more than one times in the course of cooking the otong soup. It can be put intermittently as the cooking goes on. Without it, otong soup may not be that enjoyable to the mouth because it will not be that tasty as you expect it to be, despite the presence of these other ingredients. Palm oil is also needed in the preparation of otong soup with oxtail, as it gives that reddish coloring. 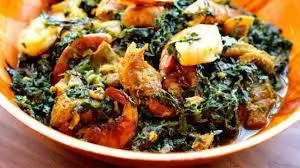 It is required to fry some of the ingredients that require to be fried slightly like the onions and the rest of them, without red oil or palm oil, otong soup would look dull in appearance ,and consequently may result in people loosing appetite for the soup. Note before using the palm oil, remember to lighten it or warm it a little for it to be lighter in weight and color. Prawn is another important ingredient in preparing otong soup, it is as well a source of protein and gives the otong soup that crayfish taste. Prawn is first ground before use. This is another spicy leaf used in cooking most local Nigerian dishes. Uziza can be used as a leaf or as its seed, which is usually dark and tiny in size. b. Add some sliced onions, ground chillies and some stock. 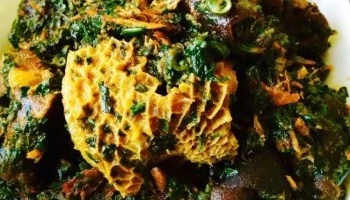 e. Finally add the shredded pumpkin leaves and pounded okro. f. Mix it properly and allow it to simmer for 15 minutes, then add crayfish,palm oil and etinkirin leaves.